After consciously stalling for a good week, I finally got the quilting done on my 1800 quilt .. just 2 bloody sections is all I needed to do .. now I did have some valid stall reasons – which presented themselves during the freemotion part – but it was either put on my big girl pants and deal with it, or this would never get finished! Prolly didn’t help that I was in a mood today .. can’t tell you why, but I was NOT a happy camper – spent all day glowering and grumbling like a bear with a sore tooth .. who had her hibernation interrupted .. betcha want to spend a day with me when I’m like that, eh? So of course being in said mood, nothing I did, I liked .. BUT, I was going to get this quilting done if I had to kill someone to do it! One of my valid stall reasons, was that I no longer had the flow for the quilting for this .. let’s see, the last time I worked on this (which is the last blog post on this), was back on the 27th of Sept with this post, no pics on that one, but I did put the one section totally together on the 24th of Sept with this post. So needless to say, it’s been a bit .. I did parts of this quilt with a free motion design – no stencils, markings, etc .. so the groove for it was definitely gone! Now that I’m no longer ready to rip someone’s head off, it doesn’t look all that bad .. will the average person / quilter notice? Maybe – maybe not. I know I will .. but guess what – it’s my quilt and of course I’m going to notice it. Now if someone feels so bloody compelled to go into my bedroom and flip my bedquilt over, then they have some other issues that need to be dealt with that have nothing to do with me and I’m going to leave that at that! My mood improved just as mysteriously as it declined earlier tonite .. no clue why, just did .. am I going to delve for that answer .. nope .. just accept it and run with it .. I don’t get like that very often at all .. but when I do, I’m miserable and I’m sure my family is wishing they were elsewhere. Cats and dog included .. least the cats can do hide under tables or something .. poor Orion has no choice being 70lbs and highly visible But I did get another dishcloth finished tonite while I spent some time with Reg after his basketball tourney .. 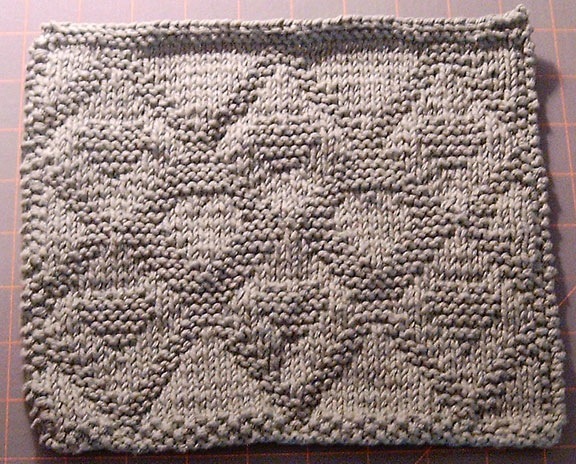 This is supposed to be sage green, but didn’t use a flash to try and show the pretty lattice pattern .. I had some serious counting issues with this and actually had to resort to using stitch markers and my fingers and toes … but this is counted as a finish .. I’ll get a daylight picture of it tomorrow .. it is really pretty. I know I said I got all the 1800 quilt sections done and I did .. see them all there all waiting so nicely for me tomorrow!! the folded ones were the ones that were done last fall, and the two open were done today.! All I need to do is trim my edges, join the sections, figure out what I’ll do with the borders and then attach the binding .. well trim those edges after it’s all together of course .. but I can’t believe it! FINALLY!!! I’ll have two quilts in the the “sew down the binding” pile .. how cool is THAT!??! It will be nice to cross this off my list and call it done .. I think I’ll get one more quilted up, then do a binding marathon .. we’ll have to see .. Kyle is waiting so patiently to have his binding finished off.. maybe tomorrow after this is all sectioned up ..
An additional comment here quoting ” being in said mood, nothing I did, I liked .. BUT, I was going to get this quilting done if I had to kill someone to do it!….” That is exactly how I felt when I quilted the Hades quilt. Now I just love it and so does Rick, but everyone stayed away from me when I was working on the quilting!! Something in my tone and behaviour would stop them in their tracks! LMAO on that one! Grace, it looks wonderful! You are so talented! Your 1800 quilt looks great. Congrats on your progress. Congrats on your UFO. I wish I could say the same. Doesn’t it feel great to have it almost done and off the list. The quilting looks very pretty. Love the wash cloth too. Your quilting looks great, Grace. We are always our own worst critics. The other quilt is lovely also. I love your dishcloths. the patterns you have knit in add so much interest. I do well to make a plain one. I’ve got two bindings ready to hand stitch – I’ll work on one of them tonight. 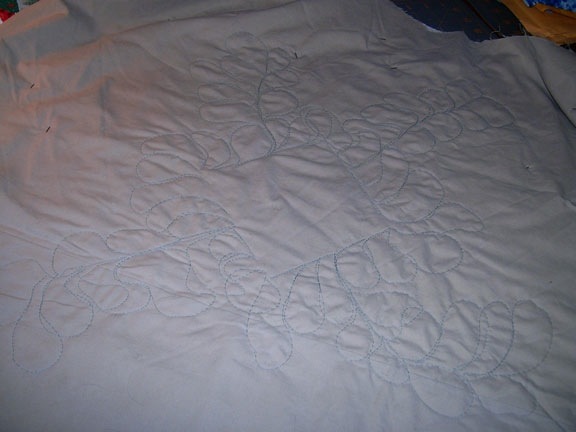 I hate it when I get out of the groove of working on a quilt – for me its usually during the piecing part not the quilting. It’s hard to motivate myself to finish up.